As I mentioned in a recent post, London Ontario is currently experiencing a transit strike. The ninja salmon are ninja-ing and salmoning with more confidence now that they have had a little practice. I hope the cold that appears to be on the way doesn't give the unprepared frostbite. 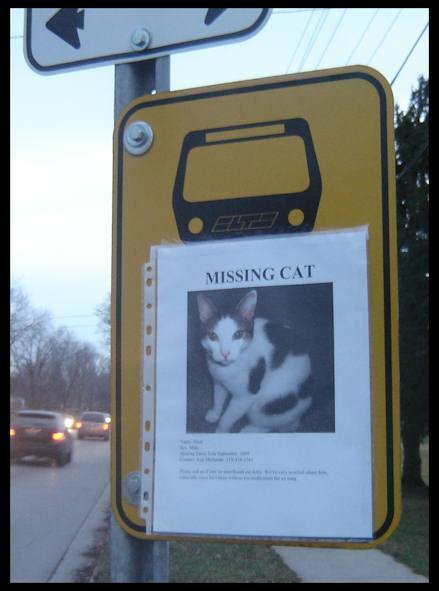 I saw that sign at Wavell and Edmonton, which is kind of near Clarke Road Secondary school. The cat's name is Pixel. I am reluctant to post somebody else's phone number on the Internet, so if you've seen him, send me an email and I'll give you contact info for the owner. That's excellent. And best of luck to the cat. Transit Strike Spawns Wild Ninja Salmon!